In 1860 the Democrats refused to accept the result of a free election. That year, their target was Abraham Lincoln. They smeared him. They went to war to defeat him. In the end, he was assassinated by a Southerner, John Wilkes Booth. 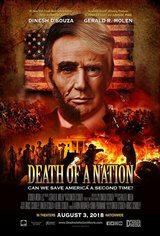 This film tries to compare President Donald Trump to Lincoln, discrediting Democrats as "the party of the slave plantation, and the party that invented white supremacy and praised fascist dictators." Filmmaker Dinesh D'Souza, who was pardoned by Donald Trump for making illegal campaign contributions, uses historical recreations to make his point.